A customer called and wanted to know why the development database was so much slower than production when both databases were on the same type of machine and same type of storage. Now the above is physical I/O as reported by Oracle from looking at the wait event “db file sequential read” in the trace file. Based upon the above data alone, it would look like the “dev” database had an I/O subsystem problem. On the other hand not all “physical I/O” as reported by Oracle is really physical I/O. The I/O reported by Oracle could simple be I/O that is satisfied by the O/S file system cache. When Oracle issues a request for I/O, in this case a “db file sequential read” (aka a single block read request) all we know is Oracle is asking the operating system for the data. We don’t know where the operating system gets the data. The operating system might issue a request for the data from the underlying storage system or it might find the block in the operating system file cache. How can we tell the difference between a read from the underlying storage or a read from the O/S file system cache? Well, from the Oracle perspective there are no statistics that differentiate between the two, but based upon the latency for the I/O request we can make an educated guess. Oracle keeps I/O latency information in the v$event_histogram views, but unfortunately these views only go down to the granularity of 1ms. For I/O from a SAN that is cached in memory on the SAN, the latency could go down to as fast as 10s of micro-seconds. What we want to know is how much I/O is coming faster than a SAN could reasonably supply the data. An 8K data transfer over 4Gb FC takes 20us for the data transfer alone not to mention any O/S scheduling and or code path. Thus a reasonable value for I/O that is faster than a SAN would/could supply would be on the order of of 10s of mircro-seconds. For example 10us is faster than even a 8Gb FC could supply 8k. Now add on some overhead for code path, scheduling etc and 100us (ie 100 microseconds) is a pretty good cut off. What we see is that production gets substantial portion of it’s I/O in less than 10us, ie this data is coming from the file system cache. In this case the query had only been run once on “dev” but had been run multiple times on prod, thus on prod, the O/S had cached some of this data in the file system cache. 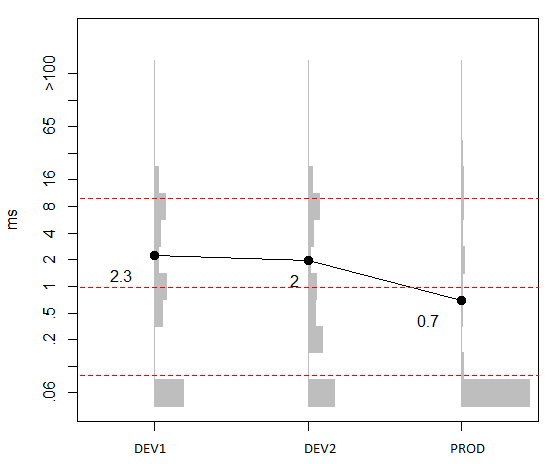 Once the query was run a couple of times on “dev”, then the latency on “dev” when down to the latency on “prod”. but by doing this alone, it would just increase the latency of the I/O as the O/S file system cache would no longer be used. In order to compensate for the loss of the O/S file system caching, then the buffer cache for the Oracle database should be increased in order to compensate for the loss. If the buffer cache is increased sufficiently to compensate for the lost O/S caching memory, the there will be less CPU used and less I/O and less latency due to I/O calls by Oracle. On the other hand if there are several database on the host then balancing the SGA sizing among the databases without use of O/S file system caching can be more trouble than it’s worth and using O/S file system caching might be more flexible. The script is on github, so feel free to fork the code and make your own changes. where “sid_ora_29908.trc” is the name of your trace file. The first histogram section is for “db file sequential read”, ie single block reads. The next histogram section is for multiblock reads. These multiblock reads are grouped by read type and for each read type the I/O is broken down by I/O size in number of blocks. Number of blocks is the first field. Here is an example of plotting using R the average I/O latency on three databases. The gray bars are histogram buckets of the count of I/Os of this latency range. It’s clear to see that the fastest average I/O latency of “PROD” at 0.7ms has most of the I/O coming from file system cache ie under 0.100ms. Cary’s Method-R tools are the best by far but of course they are pay for tools. OraSRP looks fantastic. I haven’t used it in ages. One thing I liked about OraSRP was trying to distinguish idle SQL*Net message from client waits from SQL*Net message from client waits that occur between fetches and are a more clean indicator of some application issue. Unfortunately OraSRP is only available on some platforms and the source isn’t available. I like having scripts because it’s nice to be able to modify and with scripts the should/could run anywhere. Session call graph is nice as is organizing Top SQL for each top EVENT. shows I/O latency by I/O size which is nice. The event histograms and the latency by I/O size are the two main things I was addressing parsetrc.pl. Some other things that are in parsetrc.pl that are still being polished are MB per second, max and min I/O throughput of any single I/O grouped by second broken out by I/O type – sequential, scattered, direct path, direct path temp. Also I/O rates per minute. I am in the middle of the same sort of investigation but unfortunately my Prod is much slower than Dev… even with the same cloned data behind them. I have traces collected and was going to make my way through the list… Thinking I will try your script and OraSRP first. And thanks for putting your stuff out there on GitHub. I just started shovel… errr moving some of my old code out there as well. I have some Java 10046 parsing code that I was working on that I need to tidy up and make available. Until I can get my company to spring for MethodR tools I will have to rely on my own code and the kindness of folks that release their code into the wild. Thanks for adding parsetrc.pl to your page on trace parsers and thanks for the page in general. I’ve found it helpful. coach handbags under $50 ymca on Enqueue – is it a PK, FK or Bitmap Index problem?